Although Paul was a consensus first-team All-American as a sophomore at Wake Forest, leading he Demon Deacons to their first No. 1 ranking in school history, hardly anyone projected him to have the type of instant impact he enjoyed in his first season as a professional. Not only did he step immediately into a starting role as a point guard, perhaps the most difficult position for a rookie, but he led the New Orleans/Oklahoma City Hornets from the doldrums of the NBA (18 wins in 2004-05) to being a playoff contender and 38 victories. Paul was a near-unanimous choice as the NBA Rookie of the Year and could have been selected to the midseason All-Star Game with little opposition from those who followed the league on a consistent basis. His inaugural season was then highlighted with his being named to the USA Basketball squad that represented America in the World Championships in Japan this past August. Certainly, a spot on the United States Olympic Team roster in 2008 is very likely. And through all this success, Paul maintained a demeanor and humility that only further endeared him to his teammates, his coaches, and the fans in both of his new home cities, as well as NBA officials and even his competitors. Just like his basketball skill, it is a personality and a lifestyle that can be traced back to his North Carolina home–and a background where everything began with and depended upon family and faith. 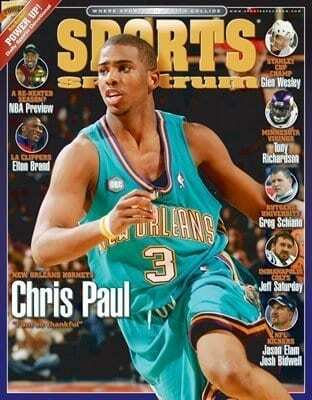 Read the remainder of our archived feature on Chris Paul in our November/December 2006 issue by clicking here.